Magic Bullet Records has confirmed the pending release of Helium Head, the debut recordings fromMUTOID MAN, the brand new venture formed and carried out by two longtime friends, Stephen Brodsky of Cave In and Ben Koller of Converge. To help break this one out to the masses, Decibel Magazine is today hosting an exclusive jam of the album's third of seven tracks, "Scrape The Walls," which boasts the rock character of the album but also sears your ears with some of the most destructive riffery of the entire Helium Head experience. 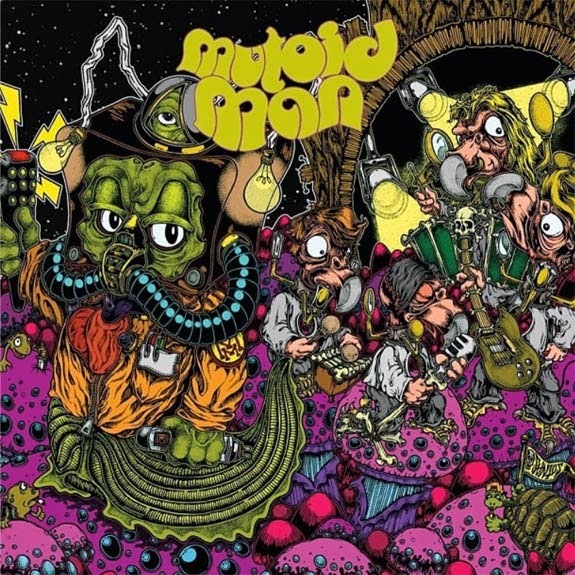 "[This is] the first Mutoid Man song we wrote" explains Stephen Brodsky. "It's about people who lose their minds worrying over money. To come up with all this stuff, Ben and I riffed-out at a rehearsal space in Brooklyn for about a year. The material picks up from where we left off with the Cave In Shapeshifter/Dead Already cassingle, written with Ben in the band. The two of us ran with that sound and formula and took it as far as we could go." Do it...do it now. Get your MUTOID MAN swagger on and "Scrape The Walls" at the Deciblog HERE. The high-water marks within the canon of heavy music can typically be both rapidly acknowledged and recognized by album names alone. Jane Doe, Until Your Heart Stops, Jupiter... Quite often, because of how impacting and paradigm-shifting the first listens are, fans of said albums can vividly recall the whens and wheres of the first time they encountered or purchased these works. The energy these MUTOID MAN guys naturally create when they jam-out is almost unspeakable. A jacked-up album firing on all cylinders as well as a few nitro tanks and rocket boosters opened to the max, Helium Head is like classic rock on bath salts and a case of energy bars. One envisions Brodsky's hands literally combusting as prog-fueled rock leads and hammering riffs reduce speaker cabinets to smoldering piles, his soaring vocals carrying not just an appropriately harmonious clean edge but also bringing out some of that searing wrath only the earliest of Cave In's catalog will document. And Koller's ridiculously intense, rabid percussive attack is of course in top form, unstoppably up-tempo and plied with more textured fills than all of Interstate 95 in both directions. For anyone thinking they have their "Best of 2013" lists well-sorted and about ready to go, Helium Head sneaks in under the gun with a Black Friday release and shakes everything up. Brodsky and Koller have done it... AGAIN. Helium Head will see digital release on November 22nd followed by its CD and LP manifestations -- the wax in three different color schemes -- on Black Friday, November 29th.